Large organizations from major corporations to small businesses, government entities and academic institutions in the public and private sectors spread across multiple departments and geographical locations issue different types of memos regularly or at close intervals. These organizations or groups also need some form of collaboration at times, employing consultants, forming a common line of action or hire the services of the other and often find it useful to get their communication in writing. You may also see agreement samples. For example, a bank have many departments such as marketing, credits, security, personnel, accounts and so on, with all of them communicating with other offices and branches spread across the country or the world, through memos and other formal internal communication. At times when they have to work with another entity for a project or a common goal, the best way that they can inform everyone else in the organization about the action is also through a memo. 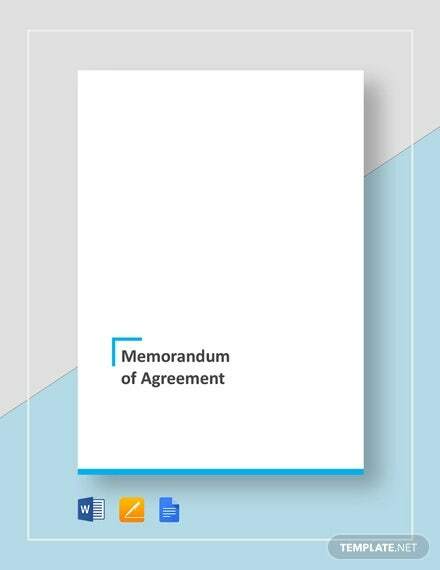 A memorandum is never more important when it comes to agreements that the company have with another organization. 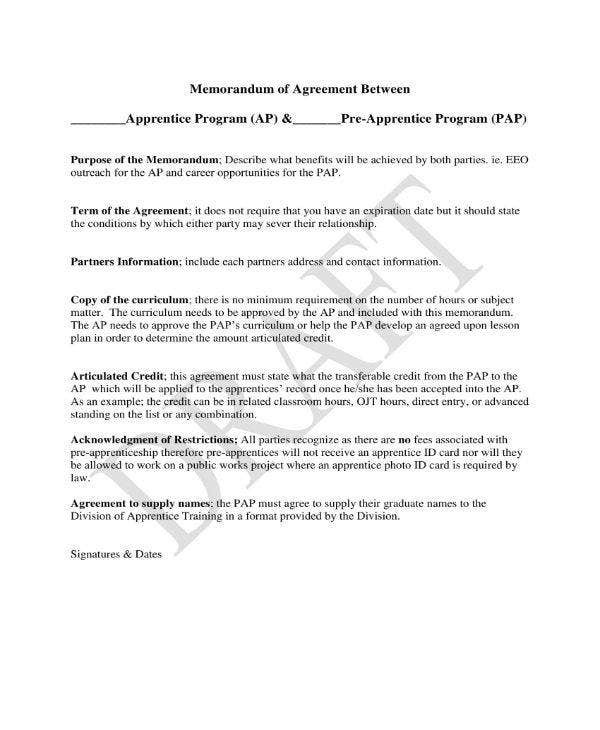 Such memos are referred to as sample memorandum of agreement, otherwise known as memorandum of understanding. 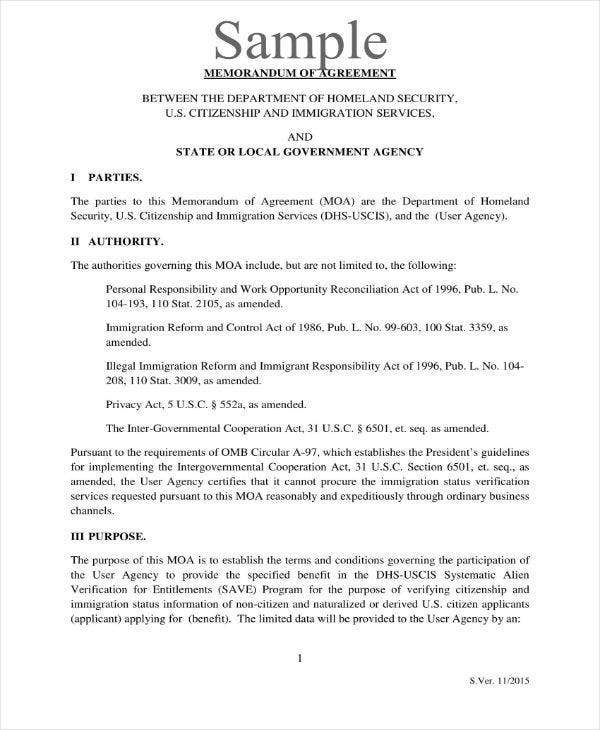 A Memorandum of Agreement (“MOA”) defined by law, is a formal business document used to outline an agreement made between two different individuals, parties or entities, oftentimes following a more detailed agreement or contract between the parties involved. A MOA can be used for agreeing to work together on a common purpose or objective and define the agreed terms of the business relationship. The main purpose of a MOA is for the parties to establish a written understanding, even as a simple document to be communicated across each of the organization’s members or stakeholders. 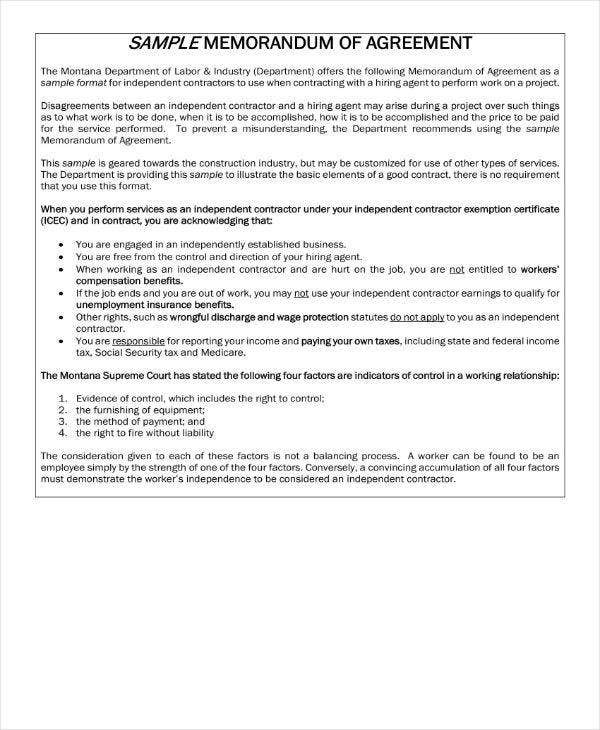 Perhaps the biggest difference between a contract and a memorandum of agreement is that a contract is a legal document and enforceable in court whereas a memorandum of agreement is neither. The latter, as previously stated, usually precedes the former, even though the differences between the two may sometimes be blurred. 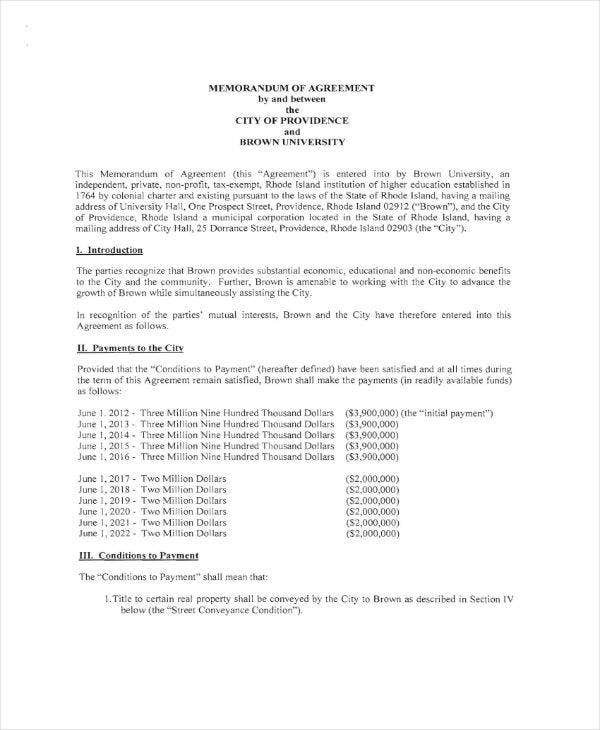 As a legal document, in its simplest terms, a contract is a statement of an agreement between or among two or more parties that involves what is referred to as an “exchange of value.” Most of the time, it involves money or exchange of any commodity such as goods, space, services, assets, etc. If there is an established agreement to offer or give one thing in return for another, it is considered a contract. You can also like memorandum of understanding templates. A contract isn’t enforceable without “consideration” in law, or without something being offered in return for something else. Additionally, a contract’s terms have to be set with detail and clarity before a court can enforce it. If a contract, for example indicates that a company is going to pay for a “collaboration” project, that’s not specific enough to be enforceable in court. The judge would have to demand evidence that both parties have had the same understanding of the “collaboration” referred to in their terms so that it can be enforceable. 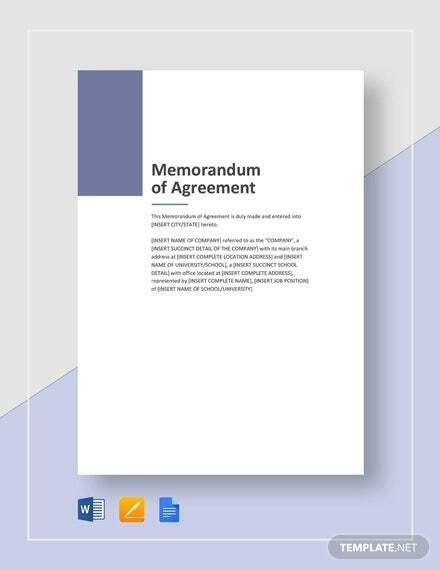 You can also read sample memorandum of understanding templates. 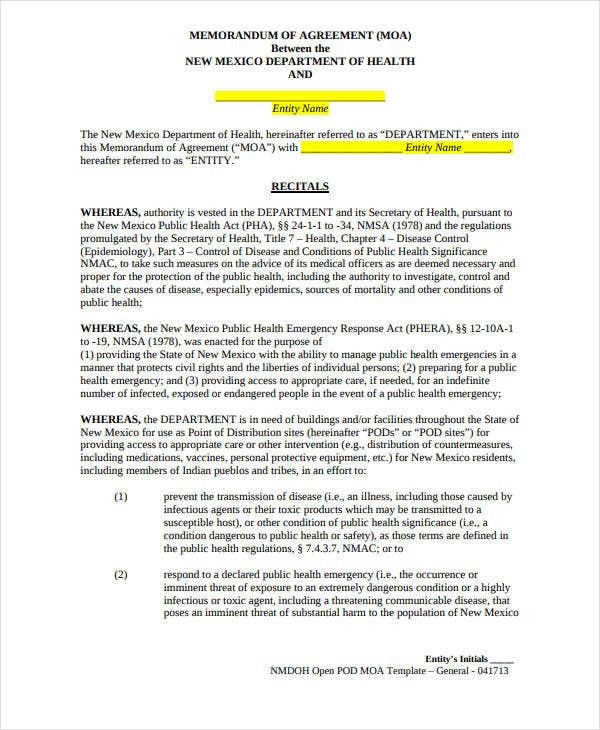 In community and health service, the purpose of having a memorandum of agreement is usually for clarifying and specifying the terms of cooperative arrangement between two or more organizations. For example, the terms may have to do with something like shared temporary or permanent space, working together on the same mission, with each of them having something to offer for a common effort, goal or with arrangements serving on each other’s field of work. You can also like free agreement templates. Communicating a memorandum of agreement might be done to establish goodwill or a good relationship between the parties, or it might be to help them monitor the terms they have agreed on. This type of agreement may also provide more clarification of the working organizations’ relationship with each other and to further make it clear which commodities, resources, goods or services in the community each of them is in charge of. You can also see memorandum templates. There are also cases when funders, in trying to promote collaboration will need a MOA with non-profit organizations through the submission of funding proposals. 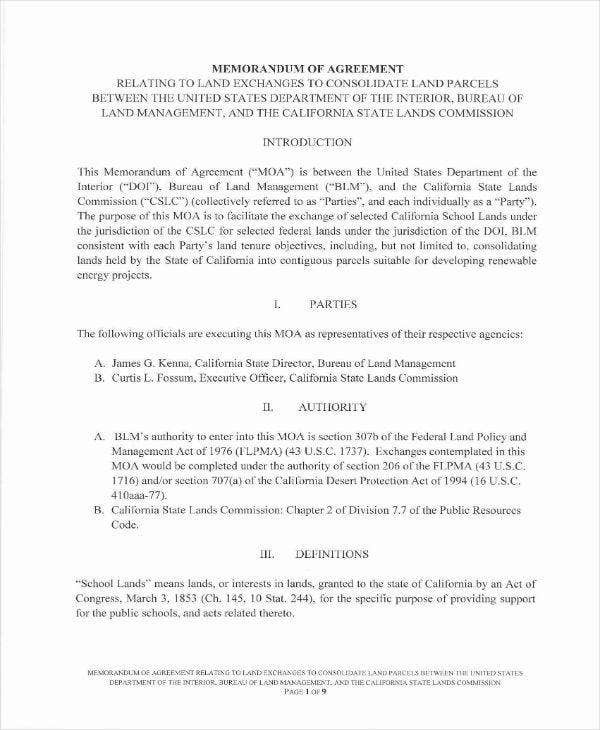 In this case, in the agreement would typically indicate the agreeing party’s commitment in working with the organization applying for grants, be it in the referral of participants, serving a part of an advisory committee. Make use of the services of another organization such as third party consultants or contractors when those services are needed, such as when a member of your community youth development program would require you to send him to another local organization to get it, instead of sending him somewhere else. To a small extent, the above-mentioned reasons or examples may be lacking or go beyond what you would need the agreement for but it may also require something a bit more formal to combine resources or other elements of your respective organizations, or work together in another way or form. You can also read sample commission agreement templates. There’s lesser chance that your organization will be the recipient of a contract or be required to sign an fully drafted memorandum of agreement as there is of you writing one. Before going to that however, you may be wondering how to read, interpret or understand one. 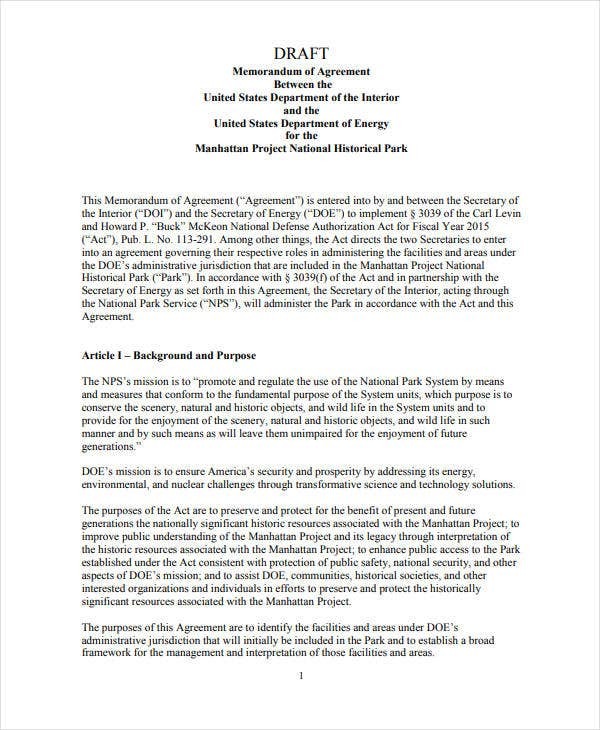 You can also read joint venture agreement templates. 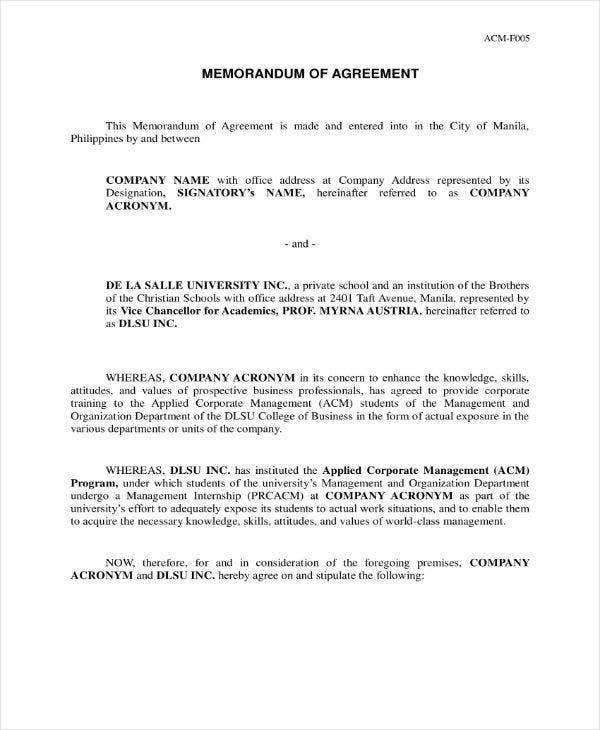 Because it also serves as a document for communicating the agreement set between two organizations, a MOA would generally look different from a contract. It also wouldn’t state the legalese one reads in a contract and would likely be shorter and would have little to no conditions that aren’t directly connected to the actual agreement, making it easier to understand. Another significant difference is you can have input into a memorandum of agreement, as needed or in certain situations. You may also like printable joint venture agreements. For example, if a grant-giving corporation requires grant applicants to include a MOA with other nonprofit organizations along with a proposal, the funding party or individual can have its own form or wording for the memorandum to be released. On the other hand, if what you’e trying to get into is an agreement that has already been decided with another entity, you may have already worked out the details together. You can also like formation agreement templates. While a memorandum of agreement isn’t legally enforceable in court, it still serves as a commitment or a promise on the part of both parties when they decide to collaborate or join efforts in working together for some common goal or action. It should therefore be taken as seriously as any other legal document in business such as a contract, regardless of its legal weight, or lack thereof. Wit that said, you need to make sure that the terms are clear to you and that you understand them, before deciding to sign. You may also read child support agreements. You may think you have a very good relationship with the other organization, but you’d be surprised how many collaborations and business relationships breaks and turn ugly when the time for taking accountability comes. No matter how good your ties are, make sure that you understand what yo are agreeing to, just to be on the safe side. 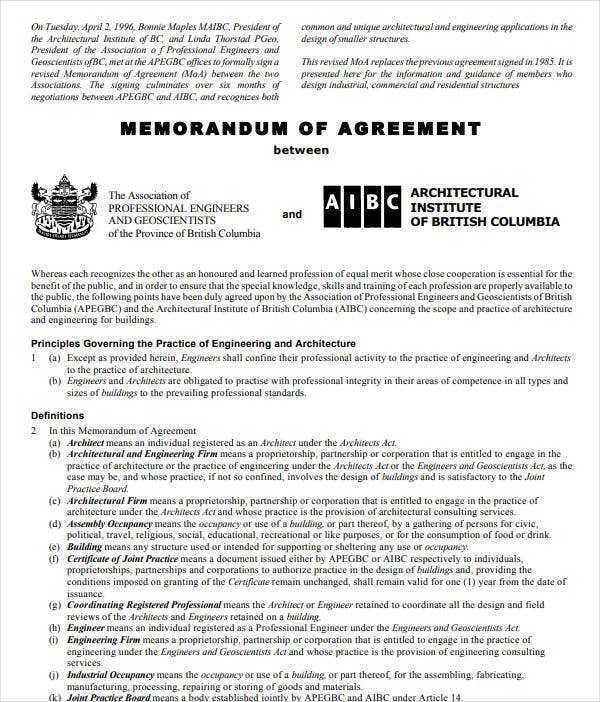 You may also like director agreement templates. You have every right to ask the other party to further define and explain the terms to you if you find anything vague or if you need clarification about a certain provision. Better yet, find a lawyer to interpret the whole document if you have the slightest suspicions. You may also read merger agreement templates. Be absolutely sure, that a an organization, you, your team and your stakeholders can at least live with, if not completely agree with all the terms and conditions outlined in the memorandum before having it signed. Upon reading the document, check if all the terms and points set are reasonable to you. In the event that you already had a prior discussion, how much of what you have expected is actually reflected on the final agreement? 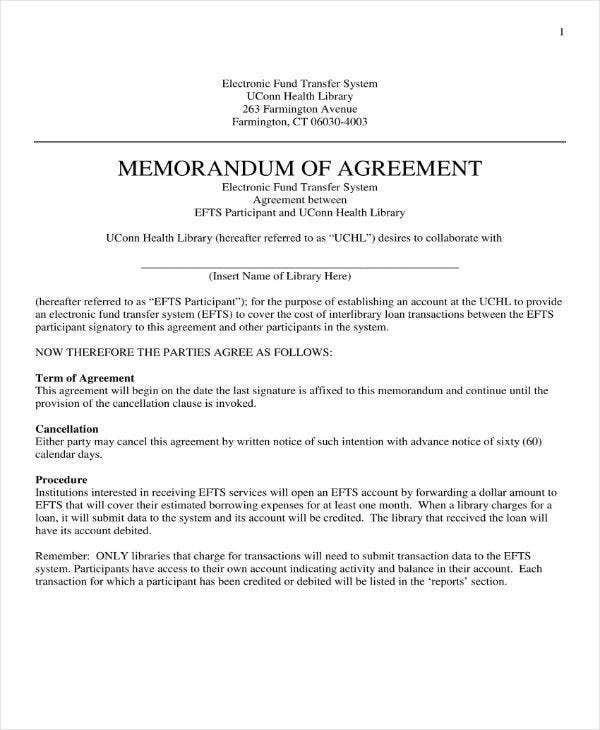 You can also read collaboration agreement templates. Does it address the problem, situation or issue you’re part of, in a way that you believe it can be addressed best? These are just a few of the questions you need to ask yourself when you go over the memorandum of agreement. In the end, it is crucial that both parties are on the same page about what they understand and agree to. Otherwise, not having a clear understanding of what you’re agreeing to would put your organization and your stakeholders in a risky situation. You may also like referral agreement templates.